Between September 24, 2012 and September 28, 2012, the officers of the Chicago Teachers Union held five informational meetings after school regarding the proposed contract. During that same time, the union, on its Web site, posted the entire 53-page proposed contract so that anyone could read it (not only union members). In addition to those discussions in the after-school meetings (which on one day lasted until 7:30 and which involved a little less than 1,000 union members), there were thousands of school discussions and individual discussions about the deal that CTU members had won following the first strike in a quarter century — a strike that made international news and which is still being discussed by workers and by the Plutocracy as the CTU vote looms. Depending upon whose counting you believe, between 10,000 and 50,000 teachers and their families and supporters filled Chicago's Loop for the rally and march on the first day of the Chicago Teachers Strike of 2012. The rallies during the strike (and before it, as far back as May 23 following the CTU rally at the Auditorium Theatre) were the largest union protests sustained over more than a week in the history of Chicago. Above, some of the marchers who filled Clark St. from City Hall to the Federal Reserves Bank on the afternoon of September 20, 2012. Substance photo by Kati Gilson.Yet there is still some talk among the union's 26,000 eligible voting members (retirees such as myself can't vote on contracts or strike, for reasons of democracy that become obvious once the issue is raised) of voting "No." In addition to those who have circulated (and repeated) outright lies about the ways in which CTU has to vote and ratify a contract (see below), there have been honest disagreements among honest men and women who helped organize the recent strike and the tumult that is still echoing. A bit of a historical review should be in order to clarify some of the reasons why it's easy to recommend a "Yes" vote. CTU delegates (and a small but growing number of media people) will remember that on August 22, 2012, less than three weeks before the strike begin, the union's delegates met in the auditorium of Lane Technical HIgh School. At that meeting (which approved giving the union President the power to pull the "ten day strike notice trigger"), the officers presented the delegates with a nine-page review of what was still at issue in the negotiations. The delegates were reminded that the negotiations had begun in November 2011 (although the first presentations had begun almost as soon as the current officers took office during the summer of 2010). One of the items still on the table in late August 2012, less than three weeks before the strike, was a "Management Rights Clause" that the Chicago Public Schools had been insisting be incorporated into the contract. It's worth re-reading, and reading out loud at every meeting where someone expresses honest questions about why to vote "Yes." (There are some dishonest questions floating around the city's more than 600 real public schools, but the honest ones at least deserve to be answered in context). Employer Authority. The Board retains the exclusive right, authority and responsibility to manage its operations, develop its policies, determine the scope of its operations, adopt a budget and decide the manner in which it exercises its constitutional and statutory functions and otherwise fulfills its legal responsibilities. Except as may be restrained or limited by a specific and express provision of this Agreement, the Board shall not be required to bargain collectively over matters of inherent managerial policy as defined by the Illinois Educational Labor Relations Act or the Illinois School Code, including, but not limited to, the following areas of discretion: (a) the functions of the Board; (b) the Board’s overall budget; (c) the Board’s organizational structure, including the creation, modification or elimination of departments, divisions, offices, sections and positions and the allocation or reallocation of the work to be performed therein; (d) decisions to eliminate work or relocate, subcontract, contract out or transfer work to a third party for one or more services otherwise performed by bargaining unit employees and the procedures for obtaining such contract or the identity of the third party; (e) decisions regarding the implementation of new technologies and methods of operation and decisions concerning the use of technology to deliver educational programs and services and staffing to provide the technology; (f) the retention of consultants, specialists and other skilled professionals on a contract or project basis; (g) the size and composition of the work force; (h) the selection, examination and classification of new employees and the establishment of hiring standards; (i) the hiring, evaluation, transfer, promotion, demotion, layoff or reduction-in-force, reappointment or recall, discipline and discharge of employees; (j) the educational or training programs provided to employees; (k) the direction and scheduling of employees; (l) the assignment of work to employees whether on a straight-time or overtime basis; (m) production and quality standards, standards of service and performance expectations of employees; (n) the development and implementation of rules, regulations, policies and procedures governing employee conduct, job performance and other conditions of employment; (o) decisions to determine class size, class staffing and assignment, class schedules, the academic calendar, the length of the work and school day, the length of the work and school year, hours and places of instruction or pupil assessment policies; and (p) decisions concerning the use and staffing of experimental or pilot programs. From the beginning of the negotations until the suspension of the strike, the city's ruling class knew what it wanted, and the best summary of the ridiculous attack on democracy that has been at the heart of this stuff for years is that paragraph above. But for anyone who missed the fact that the CTU and our allies "won," the expensive TV ads promoting Rahm Emanuel that followed the suspension of the picketing are just one example, while the bizarre declaration of war against the union by one of the richest guys in America, Chicago's Bruce Rauner, is another example. The Plutocracy that rules the world today knows who has "won" now, and the question is how Chicago's teachers continue to pour forward towards other victories from now on. The best way to do that is by voting "Yes" and then shifting to community, workplace and political action in Chicago and in Illinois. The strike was a tactic. The contract is a victory. But the war is still on, as Bruce Rauner and all of the members of his class (including those who financed the Rahm ads) know. Whether all of our brothers and sisters in the Chicago Teachers Union understand that will be clear as the months and years ahead go forward and we measure our ability to build our power. Who won in the strike of 2012? The Mayor got the main points he wanted — 2% raises with no extra pay for longer year. Longer school day. Teacher accountability in evaluations. Dropped 4% lawsuit over lost raises. Wellness program. Continued school closings and charter expansion. Giving up sick days banking etc. etc. 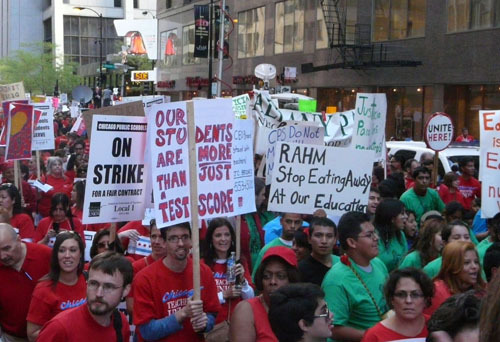 In essence, the CTU came out looking not as good as they had in the past with previous strikes. Usually, when teachers strike they have the upper hand in contract negotiations. This time the other side can claim victory. A no vote would clearly throw a wrench in the monkey works and send both parties back to negotiations to fix this lopsided victory the CTU claims. Mike, if it was so easy for the other side to claim victory the mayor and his hedge-fund buddies wouldn't have had to spend a million bucks on TV ads to do it. CTU stopped the mayor on merit pay. We froze health care costs. We have anti-bullying contract language. We can grieve special education violations. We won hundreds of new jobs in Art, Phys. Ed., Music and World Languages. If you think the privatizers won this round, then compare our contract to contracts around the country. All over the US a 3% raise is considered a miracle. Holding the line on teacher evaluations is considered a miracle. Freedom to use your own lesson plan format, etc. We won more protections related to our workday experience in this contract than we've ever had before. In order to move forward, we'll need to take this fight to other arenas - the legislature, taxing bodies, etc. We'll need to break the political power of the charter operators, etc. But this contract and the fight we waged lay the groundwork for that. If you want us to vote down the contract, you damn well better present a plan for winning us more. Where's your plan, Mike? Voting No doesn't get us any further, it just stalls us dead in the water.